Tight integration with StorNext allows individual assets to be stored and retrieved from the archive. Rich HTML5 interface and best-in-class NLE integration. Policy-based, automated migration for tiered storage and archive. Integrated enterprise search across all storage tiers. Delivery to multiple platforms, devices, and broadcast systems from the same solution. Highly customizable, scalable, and robust. A Cantemo Portal Enterprise deployment can be set up to utilize StorNext capabilities such as partial file retrieval so editors can work with highlight clips without needing to transfer the entire file from the archive. Complete end-to-end storage solution, both hardware and software. Media production has been forever altered by the proliferation of file-based workflows. The speed of the transition from traditional broadcast technologies has created new demands for innovative, robust, and scalable solutions. The integration between Quantum StorNext® scale-out storage appliances and Cantemo Portal™ provides customers with a rich, effective, and comprehensive asset management platform. By combining these tools, customers are able to address the intricate needs of contemporary production from ingest to delivery to archive, and prepare for future innovations. Cantemo Portal is enterprise-class asset management software able to support small workgroups on a single server or accommodate thousands of users and many nodes in different geographical locations. Core features include feature-rich content management, extensive administration tools, access controls, and intricate metadata structures. It provides a uniquely customizable toolset, scalable features, themed interface, and modular applications, including best-in-class integration with the leading NLEs. Cantemo Portal also provides out-of-the-box support for a range of industry-standard applications, and the built-in transcoder is able to manipulate a wide range of media formats including Apple ProRes and DNxHD. In addition to this, the modular design of the software and the rich API mean that new tools can be added to expand Cantemo Portal or even supplant existing functionality. If a specific workflow requires certain features that do not already exist within the Cantemo ecosystem, the opportunity exists to develop custom apps. The browser-based interface of Cantemo Portal provides users with a unified, platform-independent access point for searching, viewing, annotating, and editing assets. 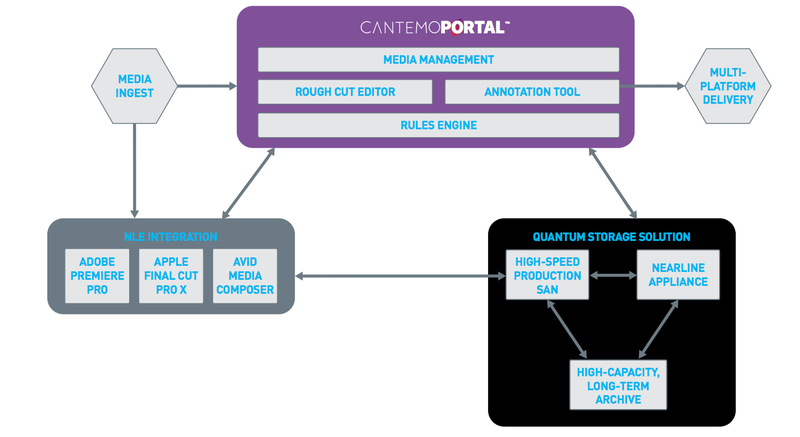 The combination of Cantemo Portal and Quantum StorNext 5 creates an environment where the automated management of every file and each storage tier ensures that media is always available. Granular control of the rules that govern the file system means more efficient utilization of each resource and a faster, more dynamic workflow. At ingest, the StorNext file system offers the lowest latency and highest throughput in the industry to ingest extreme volumes of footage at maximum speed. As files are ingested, the StorNext file system gives production teams immediate, high-speed access to full-resolution content, over both SAN and LAN connections. StorNext performance means that users can ingest, edit, and deliver, all at the same time, without dropping frames. When the project is complete, StorNext Storage Manager can migrate content based on policies to more cost-effective long-term storage—tape, disk, and even revolutionary Quantum Lattus™ object storage—but keep it instantly accessible through Cantemo Portal. With StorNext, content moved to the archive can come back again as quickly as a double-click in a file browser or opening a project in the workflow application, regardless of whether it’s stored on disk, object storage, or LTO tape. Another great benefit is that StorNext can keep the low-resolution content on online disk for instant access and high-resolution assets on archive, allowing the users to retrieve quickly and seamlessly the high-resolution files only when needed. The combination of Cantemo Portal and Quantum StorNext gives users the ability to rapidly monetize content in digital libraries. Cantemo Portal provides media producers of all shapes and sizes a forward-thinking, next-generation asset management solution, which offers unmatched ease-of-use and scalability. The Cantemo Portal app ecosystem and rich API mean Cantemo Portal is able to expand functionality and integrate with a wide range of industry-standard and emerging tools. StorNext 5 is the premier storage platform for an end-to-end production workflow that provides you the greatest flexibility and performance for your best-of-breed applications and operating systems. With a complete StorNext solution, you have a complete storage platform: shared access across both SAN and IP (Ethernet), high-performance storage, near-line and long-term archive. StorNext solutions offer the best cost/performance of any system avaialbe, and they’re 100% for media workflows and ready for the challenges of today and the future. You no longer have to compormise with a datacenter-centric IT storage solution, or get locked into a closed, proprietary solution. StorNext is the open answer. Quantum is a leading expert in scale-out storage, archive and data protection. Its StorNext 5 solutions power modern workflows, enabling high-performance, real-time collaboration and keeping content readily accessible for future use and re-monetization. More than 100,000 customers have trusted Quantum to address their most demanding content workflow needs, including top studios, major broadcasters and new, cutting-edge content creators. With Quantum, customers can Be Certain™ they have the end-to-end storage platform to manage assets from ingest through finishing, and into delivery and long-term preservation. See how at stornext.com.